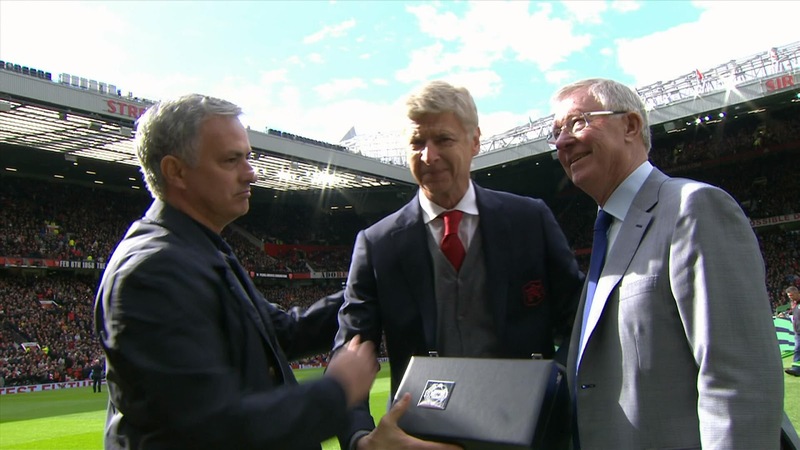 Arsenal manager Arsene Wenger has come out to praised classy Manchester United after he was presented with a commemorative gift by Sir Alex Ferguson ahead of Arsenal's 2-1 defeat at Old Trafford. Wenger, who will leave Arsenal at the end of the season, was making his final trip to Old Trafford as Gunners boss and old rival Ferguson welcomed him with a warm embrace, handing him a piece of silverware as a gesture for his 22 years in English football. Wenger and Ferguson were then joined by current United boss Jose Mourinho, as three of the Premier League's most successful managers posed for photos near the dugouts at Old Trafford. And Wenger, who also received a warm reception from the Manchester United fans as he walked from the tunnel to his seat in the dugout, was grateful for United's pre-match gesture. He said "It was very nice, the Frenchman told Sky Sports. It was just another game for me but I'm very grateful for the gesture from Manchester United. It was very classy of them and you enjoy it.. Apart from that I've come here for a long, long time and next year somebody else will sit on the bench and he'll get a very hostile reception, don't worry."